Research supported by Seva Foundation found that cytomegalovirus (CMV) retinitis is causing unnecessary blindness and mortality in AIDS patients in developing countries. Importantly, the study suggests that successful management of CMV retinitis in these countries is a realistic goal. In response, Seva's Center for Innovation in Eye care is launching the AIDS Eye Initiative, a new program designed to address the problem. A study titled Cytomegalovirus Retinitis: The Neglected Disease of the AIDS Pandemic, published in PLoS Medicine, the online journal of the Public Library of Science, indicates that CMV retinitis is causing blindness among young adults with AIDS in developing countries. The research was led by Dr. David Heiden, Medical Director of the AIDS Eye Initiative and an ophthalmologist at the California Pacific Medical Center in San Francisco. The study was conducted in collaboration with Médecins Sans Frontières and other groups. 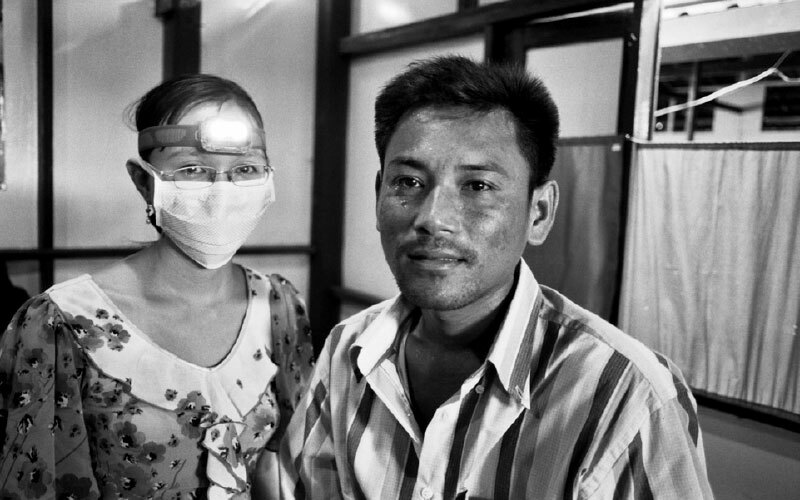 "Our research found that up to one third of patients with advanced AIDS in Myanmar, Cambodia and Thailand suffered from CMV retinitis, an infection that can be blinding," David explains. "Even though the full scope of problem remains to be defined, and even though the problem seems less severe in Africa, the study points to the need to integrate some eye care services with AIDS management services at the primary care level — a need that hadn't previously emerged in AIDS programs in developing countries. This new awareness lays the foundation for creating diagnostic and treatment protocols that will prevent blindness among AIDS patients." In addition to preventing blindness, effective management of CMV retinitis can help save lives, David says. "There’s another dimension to this work that's under the surface, but powerfully important: systemic treatment of CMV retinitis reduces AIDS-related mortality. These patients often have unrecognized CMV infection of the brain or gastrointestinal tract that can be lethal." Dr. Suzanne Gilbert, Director of Seva's Center for Innovation in Eye Care, says the research sheds light on a growing cause of blindness in developing countries that had been overlooked until now. "It just hadn't been on anyone's radar. If you look at the World Health Organization (WHO) guidelines for managing HIV in resource-limited settings, there's nothing in there about CMV retinitis. And likewise, there's no mention of CMV retinitis in the WHO’s Vision 2020 campaign to reduce preventable blindness around the world. But this new research makes it clear — if we want to prevent blindness in developing countries being hit hard by the AIDS pandemic, we need to tackle this issue." That is exactly what Seva intends to do with the AIDS Eye Initiative, a new program being created by the Center for Innovation in Eye Care. "The AIDS Eye Initiative is going to fulfill an unmet need," Suzanne explains. "While there's been a lot of progress in establishing primary care for AIDS patients in resource-poor developing countries, AIDS related blindness in those countries has gone untreated. The challenge is that those countries don't have ophthalmologists available, and the drugs to treat CMV retinitis are prohibitively expensive. What the AIDS Eye Initiative will do is create a replicable model for managing CMV retinitis at the primary care level by making it easy for primary care doctors to examine and diagnose the eyes of their AIDS patients. We'll also be working to find ways to lower the cost of drug treatments. It's a huge undertaking, but we have the expertise and the network of partners that can make it happen." Among the Seva partners signed on to work with AIDS Eye Initiative are Aravind Eye Care System (India) and Kilimanjaro Center for Community Ophthalmology (Tanzania). Each will be involved in training and field testing for the project. Dr. David Heiden has been brought on to serve as Medical Director of the AIDS Eye Initiative. "We're thrilled to be working with David," says Suzanne. "In San Francisco, David is known as one of the true experts in eye complications of HIV/AIDS. He was initially trained as an Internist and spent a dozen years as an Emergency Room doctor. David also has a great deal of experience working at the primary care level in resource-poor settings, such as refugee camps in places like Somalia, Sudan, Uganda, and the Cambodian border. And of course, he led the international team of ophthalmologists, HIV specialists, and medical and humanitarian aid workers in this groundbreaking research on CMV retinitis. So David is really the perfect person to lead Seva's new effort." David is equally excited that the AIDS Eye Initiative has found a home at Seva. "We're setting out to tackle a huge problem with this new initiative," David explains. "It's going to take real innovation and expertise to implement a solution to CMV retinitis in developing countries — and innovation is exactly what Seva is known for. I can't think of a better place for this work." Look for more information about the AIDS Eye Initiative in the coming months as plans develop.